The two most important things with a mouse are how it feels in your hand, and how well you can fine tune the tracking and scrolling to your liking. The Macally BTMouse is a new full size mouse that resembles the Macally iLaser, reviewed here in August. The differences are that the iLaser is a 5 button USB laser mouse, where the BTMouse is a 3 button Bluetooth optical mouse with rechargeable batteries & a charging cradle. I don’t have big hands, but I like my mouse on the larger side. 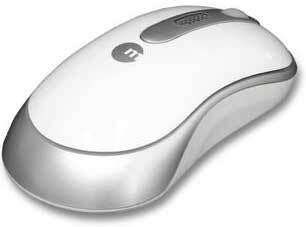 My hands tend to get sore with a mini mouse (remember the original iMac hockey puck? ), and the BTMouse has the best feel of any mouse I’ve ever used. It’s pear shaped, as opposed to most which are more of an oval. There is an indent along each side providing a place for your thumb, no matter if you are right or left handed, to provide a more precise feel moving it. For me it has proven less stressful on my fingers. The curvature front to back peaks slightly to the rear, behind the low battery/pairing LED, sitting nicely in the palm. The right & left buttons have a good distinct click, but the same can’t be said for the scroll wheel’s click, which is a bit soft. The scrolling is good, but it does have a rougher feel to it than the Kensington & Logitech mice I have used. Included in the box is a manual, the mouse, 2 AAA NiMH batteries, an AC adapter, & a charging cradle. The first thing to do is put the batteries in & charge the mouse. A red LED on the cradle indicates it is charging, & a green one indicated fully charged. Once charged, pairing is easy and holds between restarts and sleep/wake. Simply hold the pairing button for a couple seconds, then choose “Set up Bluetooth Device…” from the Bluetooth menu or click the “Set Up New Device…” button in the Devices section of the Bluetooth system preference and follow the on screen instructions. The manual is short but covers everything needed, with illustrations for features and instructions. The biggest thing to get used to if you have never used a Bluetooth mouse is the power saving feature. After about 5 minutes it will go to sleep if you haven’t used it. If you’ve been engrossed in writing something, you might be startled when “Connection Lost” with a mouse icon appears on screen. A quick click of one of the mouse buttons & you’re back in business. Charging is also different if you’re accustomed to a USB mouse. Macally recommends placing the mouse in the cradle at the end of each day, although on multiple occasions I did manage to get 3-4 evenings use on a single charge. There is also an on/off switch for increased power savings. Apple’s Keyboard & Mouse system preference is used for tracking, click, and scroll controls. Like most Bluetooth mice, the Macally BTMouse does not supply its own software. This unfortunately means that the scroll wheel click can’t be programmed without buying a $20 shareware mouse driver (SteerMouse). This is the one thing I really disliked about the BTMouse. Kensington’s MouseWorks & RadTech’s RadMouse drivers work with their Bluetooth mice, so why can’t other vendors (Logitech’s MouseWare doesn’t work with their Bluetooth mice either) do the same? Adding a driver, in the box or downloadable, would enable the unusable 3rd button and also allow Macally to do a better job with the controls than the default Apple settings. Your mileage may vary for how it feels in your hand, but this is an very good mouse overall. 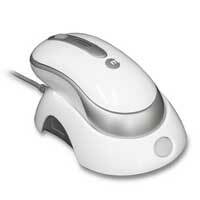 If not being able to program the scroll wheel button isn’t important to you, then this mouse rates 4 out of 5. If it is, then the lack of software and the feel of the scroll wheel click bring it down to 3 out of 5. Pros: Good shape & good feel. Includes charging cradle. Holds pairing well. Cons: Can’t program 3rd button out of the box. Scroll wheel could be better.